The Antarctic climate is generally cold, dry and windy. The temperature will remain below freezing at all times. Respite will be had inside the communal and sleeping tents at Union Glacier where sun and body heat will warm the air up to 10C (50F). Outside temperatures at Union Glacier will range between -4C and -12C (25F to 10F). Windchill will make it feel colder. Unsurprisingly there is a required gear list issued by ALE for those who want to climb Mount Sidley. 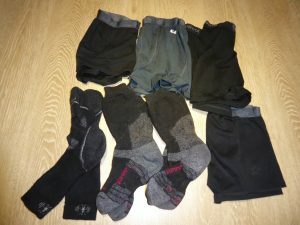 This blog is about that gear. It focuses on the technical gear rather than leisure clothing. The greatest risk is that of frostbite. When the temperature is just below freezing and there is no wind, conditions can be quite benign with all that sunlight bouncing around. Sunburn and snow blindness then become the risks to guard against. Antarctica is the windiest continent. A high pressure system tends to sit over the continent during the summer and this pushes katabatic winds off the Antarctic plateau towards the surrounding oceans. The build up of high density cold air over the ice sheet and the elevation of the ice sheet brings into play enormous gravitational energy. Where these winds are concentrated into restricted areas in the coastal valleys, the winds blow well over hurricane force. This not something, I hope, I will experience. However, the winds at Union Glacier are at least strong enough to scour away the snow so as to enable use of the ice runway there. Katabatic winds tend to be dry. In other words they desiccate anything they come into contact with, including human skin. So normally I will be trying to ensure that my skin is covered at all times. In stormy conditions, the temperature can drop to as low as -40C (-40F). I have experienced -30C (-22F) in Finland. So this will be a similar experience. I am grateful to Adventure Peaks for the advice provided in assembling my kit. They have also been my agent in organising the overall trip. My boots are Millet Everest boots. 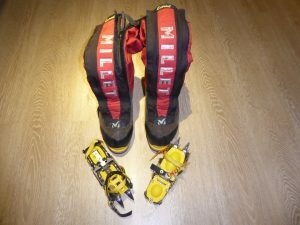 These are the sort that are used on Everest and other 8,000m peaks. They are an insulated double boot with inbuilt gaiters. The inner boot is removable and can be worn by itself, e.g. around camp. As this is the only expedition that I am ever likely to need such boots, I have been able to hire them rather than buy them. They retail at around £560 a pair, though by shopping around a cheaper price can be found. With them I will wear Grivel 12 point crampons. These are steel crampons which I have had for a number of years. On my feet I will wear both thin liner socks (Bridgedale – not shown in the photos) and heavyweight socks (Bridgedale Summit or Smartwool). Three pairs of liners and of heavyweights are needed in case they get wet from sweat and freeze. I will have four pairs of underpants. Two are merino wool and two are of lighter material. No cotton is permitted as cotton more easily absorbs moisture, will not wick moisture away from the body and is difficult to dry in the expected conditions. Much of my gear is by Rab. For the legs, this is no exception. All items are made by them. Well, their gear is amongst the best. Perhaps they should be sponsoring me! Here we have two base layers with a thin polyester based thermal and a heavyweight Powerstretch base. 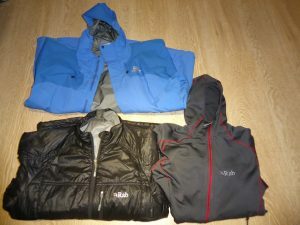 Both can be worn together, as I did for my Elbrus ascent. Over these I have a Rab Vapor-Rise guide pant. This is a lightly insulated and stretchy softshell. Unless it is very windy or cold I am hoping the Vapor-Rise this will be my top layer in most cases. I have bought the Vapor-Rise for the trip but it will be suitable for Scottish winter conditions. For really cold or windy conditions, or when immobile in my tent in a storm, I then have a Rab Photon pant to go over the lot. This is of Pertex microlight construction with Primaloft insulation. It is similar to one of my upper body layers (see below). The Photon pant promises to be very warm. It has full length ankle to waist zips so can be put on or taken off without needing to remove crampons. I am also considering taking a hardshell pant (not pictured) which I happen to have for further protection from wind. Here I have a short sleeve mesh base made by Brynje (bottom left), a thin long sleeved base (bottom right) and two thicker tops with half zips to assist with regulation of my temperature. When the wind is not blowing, it is surprising how little you have to wear when climbing. The Brynje base was kindly provided free by Nordic Life whilst I was on my Norway trip last year. It is surprisingly effective with the warm air trapped by the holes in the mesh. With less material it also tends to be less smelly when worn day after day. 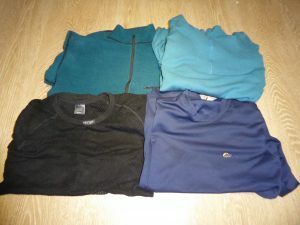 One, two or three of these could be worn at any one time depending on conditions. The likelihood is that just two will be worn at the same time. On top of these, there are next the following layers. First a Rab (yes Rab) Powerstretch hoodie for warmth (bottom right above). This has thumb loops to provide protection around the wrists. Second there is a Rab Pertex/Primaloft insulation layer. This is like the Photon pant described earlier. It is very warm and is my best bit of kit. It is very versatile and has been to the summit of each of the six continental volcanoes I have climbed so far. Finally there is an old Mountain Equipment Goretex cagoule. This is on its last legs, but will be fine for further protection from the wind and snow. 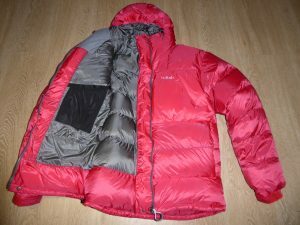 The final upper body layer is a Rab Expedition down jacket. The only colour in my size was red, so I do not think that there is any danger of me not being spotted when we are on the mountain! This jacket is designed specifically for high altitude and polar regions. It has loads of pockets, including two inner ones where a thermos flask and food can be stored and not freeze. One of these inner pockets can be seen in the photo above. 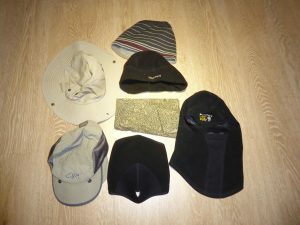 Not just one hat but two beanies (one thicker than the other), a wide brimmed hat (for those balmy sunny days), a baseball type cap (with detachable neck cover), a buff, a balaclava and a face mask. With the dry atmosphere it can be important to cover the nose and mouth so that you breathe warm, damp air – the cold, dry air can desiccate the airways and cause irritation. In windy weather I will likely be wearing balaclava, beanie, face mask and buff! After the face, the hands are at most risk of frostbite. At the bottom of the picture, there are two pairs of thin and thicker liner gloves. The blue thicker ones are Rab Powerstretch gloves. These gloves are worn under the others shown in the picture. I am required to have two pairs of each (in case of loss) so I am hoping that Santa will be providing the second set of each. On the mid-left are some Marmot guide gloves which are suitable for benign conditions. To their right are some Marmot insulated gloves. 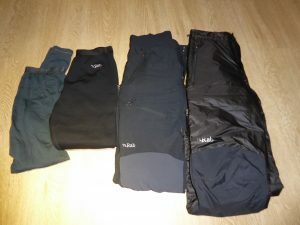 I used these on Elbrus summit day, but they are not suitable for the worst conditions that Antarctica can throw at you. 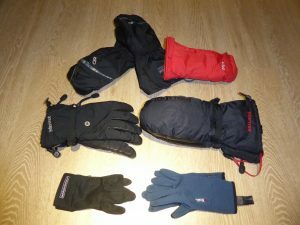 The ones at the top are Outdoor Research Alti-Mitts. The mitts are waterproof, insulated and have removable liners (the red inner shown in the photo). They also have pockets to insert hand warmers. They are very warm and would be suitable for 8,000m peaks. All of the gloves, other than the liners have wrist loops to prevent them from blowing away in the wind should they be taken off. The sleeping bag is a Rab Expedition 1400. This is rated to -40C. I will also have a silk liner. 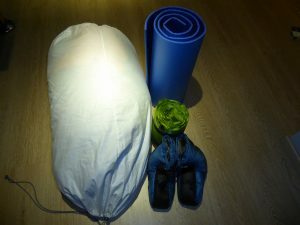 This sleeping bag retails at £699 (though you can find it cheaper). Again I have been able to hire one. As for mats I will have a foam one and a Vango Aero blow up one. One luxury I have invested in are Rab down slippers to keep my feet warm when in the tent. I will also have earplugs and an eye mask to deal with the 24 hour daylight I will experience. 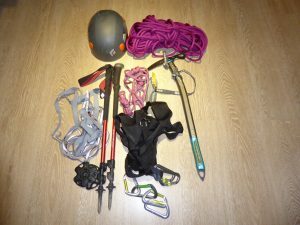 As might be expected, I will have ice axe, walking poles, harness, karabiners, helmet and various ropes and slings. Glacier travel is involved and we will be roped up to mitigate against slides and falls into crevasses. 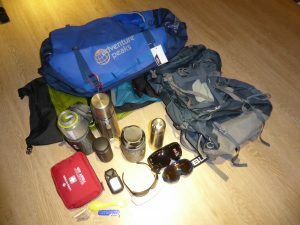 70 litre Osprey pack, various dry bags, two sets of goggles and two sets of sun glasses with category 3 or 4 lenses, water bottles and insulation for them, 1 litre and 500ml thermos flasks (little one to go in the down jacket), insulated mug, GPS, medical kit, knife, spoon and bowl (latter not pictured) and an Adventure Peaks 100 litre duffel. Well here is a picture. I will have to weigh it all at some point! It will have to be carried, whether on my person or in bags or on a sled. This short blog refers to a video which shows some of the preparations undertaken for the season at Union Glacier. The video was produced for Antarctic Logistics and Expeditions (ALE). ALE will provide the logistics for my trip to Antarctica in January to climb Mount Sidley. The video shows the conditions likely to be faced at Union Glacier. If it is too long for you to watch all the way through, it is worth going to the end to see the Ilyushin plane landing. Union Glacier is the initial stopping off point or hub for expeditions run through ALE. I will only spend a couple of days here (weather permitting) either side of the Sidley climb. The bulk of my time in Antarctica will be spent on the mountain in even more primitive conditions. 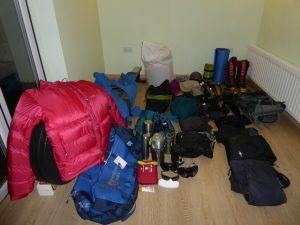 In my next blog I will cover some of the kit I am taking with me. Since writing this blog I have been provided with further information about ascents of Mount Sidley. A more up to date list of those who have climbed all of the Volcanic Seven Summits can be found here (as of January 2019). The previous blog provided a snapshot of my impending expedition to Mount Sidley. This one expands on that and provides further background on the Volcanic Seven Summits. 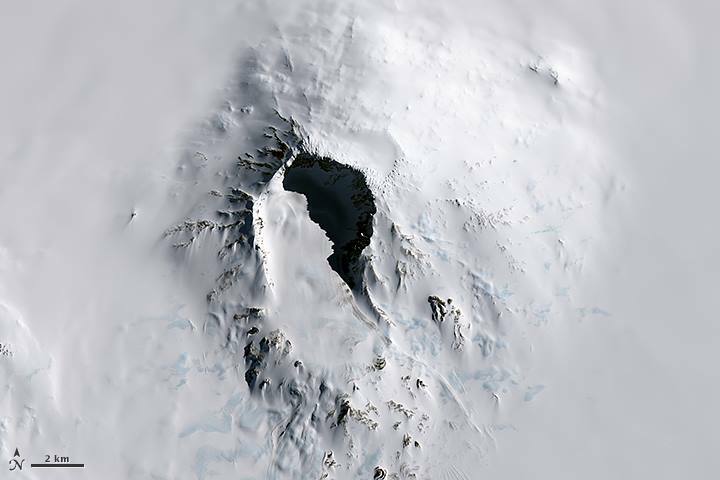 Mount Sidley is the highest volcano in Antarctica. It is probably not the most famous volcano on the continent. 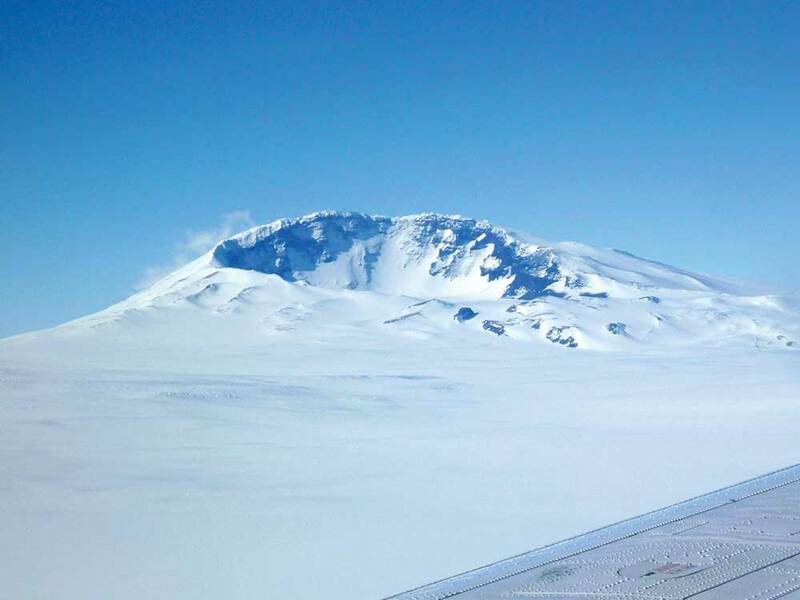 Mount Erebus holds that honour because it is active and because it is more accessible. Mount Sidley is a dormant strato volcano situated at the southern end of the Executive Committee Range, a line of five volcanoes in Mary Byrd Land. The range is around 100km (60 miles) long and is located a long way from the South Pole – in fact it is many hundreds of miles away. You will see the Executive Committee Range to the left of the Ross Ice Shelf in West Antarctica on this map. Vinson Massif, which is the highest mountain in Antarctica, can be seen on the map in the Ellsworth Mountains near the Ronne Ice Shelf (just in the top left quadrant of the map). Mount Erebus, which is the highest active volcano in Antarctica, lies at the edge of the Ross Ice Shelf. Next is a satellite picture of the Executive Committee Range. Mount Sidley is the one near the bottom with the obvious crater that casts a shadow. Mount Sidley’s summit stands at around 4,285m (14,058ft) and the mountain has a main caldera that is 5km (3m) wide. There is also a smaller caldera immediately to the north east, not easily seen on these photographs, which sharpens the summit ridge. The American, Rear Admiral Richard Byrd, discovered the mountain in 1934 on an aerial expedition. He named the mountain after Mabelle E Sidley who was the daughter of a contributor to Rear Admiral Byrd’s expedition, William Horlick. The mountain did not receive an ascent until 11th January 1990 when a USAP scientific field party was in the area and a New Zealand guide, Bill Atkinson, climbed it. Here is a closer view of Mount Sidley. You can clearly see the principal crater. Mt Sidley is remote, very remote. It is over 940k (580 miles) from its nearest higher mountain (Mount Gardner in the Ellsworth Mountains). It rises over 2km (1.25 miles) above the surrounding ice sheet. The only way of getting there is through the logistics of Antarctic Logistics and Expeditions (ALE), an American company that runs regular flights into the continent. Access to the upper reaches of the mountain has been up through the main crater. I believe that most, if not all, previous ascents have then been along the eastern rim of the crater. Kilimanjaro and Elbrus receive thousands of ascents a year. Pico de Orizaba and Damavand will receive a few hundreds of ascents a year. Ojos del Salado will be climbed 50 to 100 times a year. Mount Giluwe will be climbed perhaps 20 times a year. There is some debate as to whether one of the volcanic cones in the Kunlun area of Tibet (which are 100-200m higher than Damavand) might count as the highest volcano on Asia. They are pyroclastic cones through which volcanic activity vents. The only one with any significant prominence (Dahei Shan – c400m prominence) is lower than Damavand at c5,104m). Kunlun itself is c5,800m but has a prominence of only around 120m (400 feet). So the general consensus is that they are not volcanic mountains. The seven listed above are not as hard as the Seven Summits (the highest mountains on each of the seven continents), though two (Kilimanjaro and Elbrus) are on both lists. But the volcanoes do take you to some interesting parts of the world! At the time of writing this blog, over 400 people have climbed one or other versions of the Seven Summits, i.e. the highest mountain on each of the seven continents – see this link. Only nine or ten people have climbed all of the Volcanic Seven Summits. My research indicates that just 24 people or so have ever climbed Mount Sidley. Set out below are more details on each. It is worth stating at this point that information on Mount Sidley is relatively hard to come by. If any of the facts set out in this blog are incorrect, I am happy to be corrected! First I list those who have claimed to climb all seven of the volcanoes. The details include nationality, age when the individual climbed the final volcano, the date of the final ascent (and of the first ascent in brackets) and the volcano last ascended. The first two to complete did so together. One was a Romanian girl who was only 16 at the time. You can also see that there is a preponderance of Russians in the list. In fact six of the ten are Russians. I met Paul Nicholson very briefly on the day I summited Ojos del Salado. He was in a group on an acclimatisation climb that I passed as I was descending. He reached that summit two days later. As I did not let on as to what my objective was, I very much doubt if he remembers me! “The second attempt of Ojos del Salado took place on March. This time my very, very supportive husband came with me for the first week. I had been quite down at the thought of two extra weeks away from home, and being together helped enormously. This time I also found a much more experienced guide and assistant guide, and thankfully it did not cost my sponsors too much extra. After acclimatising properly this time, we set off for the summit on March 21. We all felt strong. The weather was fine. Just as I was telling myself that everything was too good to be true, our progress suddenly broke down. It could have been any combination of factors. Long story short, we ended up taking a route which was utterly gruelling. I’d never put myself through such physical exertion in my life. We just about managed to struggle through and arrived at the crater, in howling wind, in the early afternoon after leaving camp at 5am. Long story short, after a lot of tears and heartache it was decided that we were too far gone to make the final push. I could barely walk in a straight line, and my guide was sitting on the snow shuddering from cold and exhaustion. I felt more than a little frustrated as I stood right under the nose of the summit rock staring up at a point which seemed both just above our heads and 100 miles away. In the end our guide was right. If we had attempted the rock climb in our condition, we could easily have injured ourselves or worse. We got back down to 5,800m camp after dark. Next morning I woke early and lay in my camp bed, cursing the way things had gone. It felt horrible to have missed getting to the top by such a small margin. But I also felt that to waste more time and money, just to gain the final 30 metres, would be pure egomania. It seemed really, really silly to splash out on another attempt when the whole goal of the project was to raise funds for cancer research, not satisfy some sort of personal vanity. “The volcano is located in the West Antarctic and is part of the Executive Committee Range. The first crossing of the area was carried out in 1958-59 and the chain has been visited by an international scientific expedition in 1990 where it seems that the New Zealand Bill Atkinson has made the first ascent (unofficial). This, in the opinion of Mario Trimeri and Alex Abramov, is not really believable for the simple fact that Atkinson did not report any photographs to support this assertion, it was not able to provide any information on the ascent route and finally claimed not to be sure of arriving in top. I will leave readers to make up their minds on this and I would add only that Bill Atkinson may well be “a man of science” but he is also a well-known guide whose achievement was recorded in the American Alpine Journal here – http://publications.americanalpineclub.org/articles/12201119601/Antarctica-Marie-Byrd-Land-Executive-Committee-Range-Mt-Sidley-4285m. He has also been an assessor for the New Zealand Mountain Guides Association from the mid-1980s onwards. It also ignores the fact, as shown in the information below, that there were two further likely ascents in the early 1990s. Anyway, I now list below details of those ascents that I am aware of. Bill Atkinson (New Zealand) in support of a USAP scientific field party. I have no evidence that he was accompanied by anyone else. Bill McIntosh (USA) and Kurt Panter (USA). A paper prepared by Kurt Panter in relation to his research connected with Mount Sidley is available via this link. Given the contents of and the acknowledgements in the paper, it is almost certain that a number of the party would have ascended Mount Sidley. The ascent would probably have been in late 1992/early 1993. Note that the paper states that the summit elevation is 4,181m. And here is a link to a later paper from 1996 which includes material from the earlier one. The papers include a map showing where samples for the fieldwork were taken, including a number in close proximity to the summit. See also the link under 5 below. Bill McIntosh (USA) and Nelia Dunbar (USA). See also the link under 5 below. This was the first commercial expedition organised by ALE. The first two people to complete the seven volcanoes circuit were on it. Scott Woolums is an ALE guide and he has also made a second ascent. Aleks Abramov runs the Seven Summits Club website and guiding company and I have found some of the information in this blog (or clues of where to look) from there. He again confuses Bill Atkinson as a scientist, though he does repeat the claim that Bill Atkinson could not remember his route or whether he had even reached the summit. This was ALE’s third and most recent expedition. Rob Smith is a guide engaged by ALE and he lives near Fort William, Scotland. If I have identified the correct Dylan Taylor, then he is an American guide who has also worked for ALE, but I have not been able to confirm this. Here is the entry from The Alpine Journal. So this blog contains most of the information that I have been able to collect on Mount Sidley. Other than information in other scientific journals and a little on the ALE website there is little more out there on the internet. In my next blog on Mount Sidley, I will link to a video which gives some idea of conditions at Union Glacier. Subsequently I will deal with my preparations for the trip. If you have read the About Me section of this website, you will know that completing the circuit of the Volcanic Seven Summits has been an ambition of mine and that a trip to climb the final volcano, Mount Sidley in Antarctica, is planned for January 2017. In my next blog I will provide some detail on the Volcanic Seven Summits and a bit of history about climbs of Mount Sidley and the other volcanoes. A later blog will provide some insight into life on the ice and the sort of gear I am taking. In this blog I will describe a little of what I will be facing in January. Mount Sidley is one of the most remote and rarely climbed peaks on Earth. It sits in an ice desert many, many miles from anywhere really. It has a harsh environment. To reach it requires a flight from the southernmost tip of Chile which lands on an ice runway at an outpost known as Union Glacier and then a flight onward by ski plane. Here a base camp is set up and the pilots wait with the plane whilst the climbing team attempt the summit. We have seven days to achieve this. In perfect weather the climb could probably be achieved in three days. But the area is regularly hit by strong winds and snow storms. This weather can pin you down in your tent for days. Expected temperatures will be between -15C and -30C. So the camp needs to be made robust. This is done by building ice walls around the tents to provide some protection from the wind and flying snow and ice in addition to the usual placing of anchors to hold the tents up. A high camp also needs to be set up. It is over 2,200m (7,210ft) from base camp to summit. This cannot be done in a day. So we will ski, pulling pulks (sleds) from base camp to high camp at around 3,000m (9,850ft) to take up gear and food. These will be cached and we will return to base. This is typical of acclimatisation – climb high, sleep low. There is then a return to high camp which is then set up. This could not be done before in case a storm came through and damaged tents. The summit can then be attempted. Occasionally a second, higher camp may be placed depending upon the route taken. Of course, at that time of the year, there will be 24 hour daylight. So a summit attempt could be made at “night” if weather conditions so dictated. Above the first high camp travel is on crampons and is likely to be roped in case there are crevasses. Who else is going? The simple answer is that I do not really know. Logistics are organised by Antarctic Logistics and Expeditions, a company that is based in Salt Lake City, Utah. I am expecting that they will provide a guide. An experienced Austrian polar guide called Christoph Hobenreich has put together a team of three Austrians who will also be there. So the team numbers six. I continue my preparations in terms of trying to ensure that I am fit and resilient enough to make the trip a success. Time will tell if I have been successful! 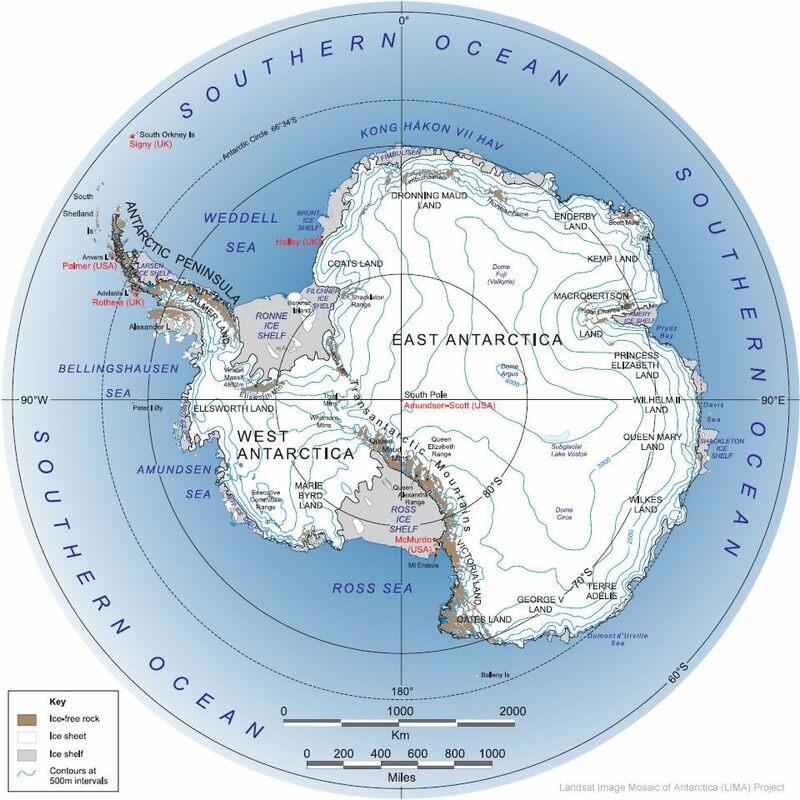 The location of Mount Sidley is within that part of Antarctica known as Marie Byrd Land. Marie Byrd Land covers an area of 1.6 million square kilometres – that is three times the size of France. The region is rarely visited. Just a few scientific expeditions plus three commercial climbing trips have been there. It is probably the largest “no man’s land” on Earth.